This entry was posted on October 4, 2012 at 6:39 am	and is filed under Analysis Services. Tagged: power view, sql server, ssas. You can follow any responses to this entry through the RSS 2.0 feed. You can leave a response, or trackback from your own site. We hit a related issue today. If you have SSDT without SP1 and you try to create a new Tabular solution using a workspace instance upgraded to SP1 you get an error message stating that the workspace db is not compatible. So, what happens is this: SSDT (RTM) issues a create statement with no Compatibility Level in it. This results in a db with the default (latest) Compatibility Level for the instance (e.g. SP1). Then, SSDT tries to open it and fails. In this case we’ll have to create a RTM Compatible (1100) db using a SSDT SP1 and then use that in SSDT RTM. I hope thy fix all this in SP1 RTM. Thanks for the post. 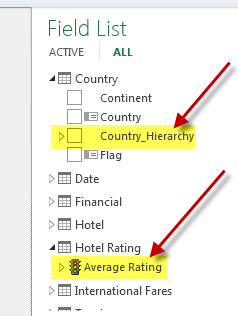 I have been banging my head trying to figure out why hierarchies and KPIs were not showing up in the Excel 2013 PowerView. After installing SQL2012 SP1, my database shows SQL Server 11.0.3000 but a right-click on the database then properties and then Options shows Compatibility Level: SQL Server 2012 (110) not 1100 or 1103. The drop down list also only shows compatibility 90, 100 and 110. On my SSAS instance I do see Supported Compatibility Level 1103 but the actual Database in SSAS is set to 1100 with no drop down list. 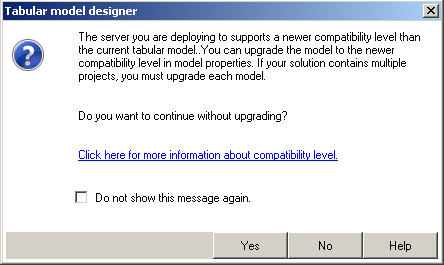 The compatibility level that you are interested and that I posted about is for Tabular SSAS. This is a new setting. You can update yours in the model properties in SSDT and redeploy. That is what I have posted here. Another option is to simply script your SSAS database in SSMS and then update the compatibility level value and then run the alter script to change your value. Unfortunately you are not able to simply modify this in the property window where you are seeing the value and like I posted in my blog with the screenshots. HTH, good luck. Scripting did the trick! Thanks a ton! Here is an interesting finding (maybe). I could not update compatibility mode remotely using SSDT because the database that I was connecting to was located on another machine running SQL 2012 SP1 (11.0.3000) and my local machine was running SQL 2012 (11.0.2100.6), When I looked at the .bim file properties the Compatibility Level was grayed out. 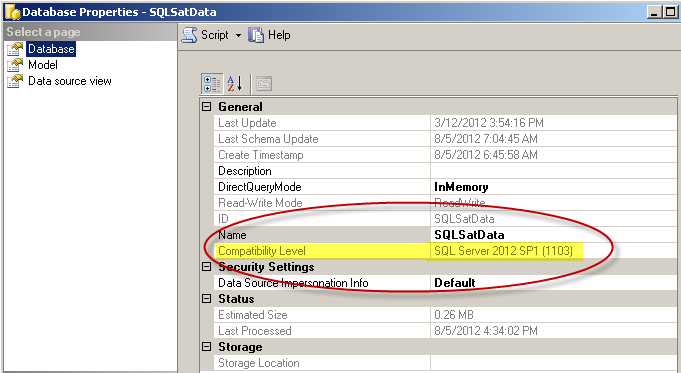 Once I updated the local machine to SQL 2012 SP1 I was able to update using SSDT. The Compatibility Level drop down list was enabled in the .bim file properties window. Yes, you need to also have SP1 installed on the remote machines as well. Though I had to change the Compatibility Mode in my SQlServer Data Tools project and re-deploy: I could not change it in SSMS (as from your screenshots) because it appeared disabled. Good to hear. If you want to do it in SSMS you can script the database and with the alter statement that is generated you will be able to modify the compatibility value, but you would need to know what a valid setting is of course.